Hi guys, been a while I wrote on skin care, and I'm super sorry I've been MIA on relevant issues you guys loved the most! But I'm back now and we gonna catch up on everything we've missed. So let's start with MY favourite face MASK. This is for everyone battling with acne or dark spots or dull skin. You can get rid of these with turmeric and Honey; I made short video on it but I'll definitely make a better one showing you the exact quantity of both ingredients that I mix together and the consistency. Guys, for everyone that's sent me a DM asking how they can clear spots, this is what I do. I apply Turmeric and Honey and that's one of the secrets of my clear skin. Why these two are the best? Honey has natural anti-inflammatory and antimicrobial properties, making it an excellent at-home treatment for fungal infections, psoriasis, dry skin, and even burns. Turmeric on the other hand is an antioxidant and anti-inflammatory that has been evaluated in treating acne(by drying it up), brightening dark spots on the skin, and treating fine lines and wrinkles. So the combination of these two is quite explosive. 1. 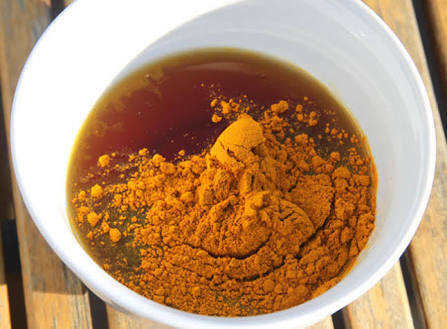 Mix half a teaspoon of turmeric(you can find it in a supermarket; at their food section. It looks just like curry), and a tablespoon of natural honey. Just make sure the Honey is bigger so it can cover your face. 2. Apply the mixture on your face and wait for about 20 minutes, then wash off. Please note that turmeric will stain your sheets if you lay in bed, so you gotta be careful with what you're around when you got this on. Also for the fact that it's a lightening agent, when you wash off, you'll look somewhat yellow or orange, but this is just an overnight stain as it goes off the next morning. Voila! That's my everyday favorite face MASK! I hope you try it too for about a week and share your results with me.